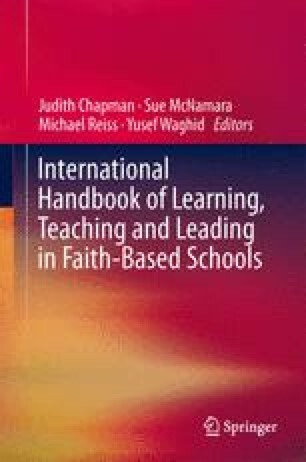 One of the most common misunderstandings about religious education is that it is confused with education in a particular religion – meaning that the teaching of religion is confused with the teaching about religion. I will, therefore, commence this chapter by exploring a cogent understanding of what it means for women, in particular, to acquire education in the religions of Judaism, Christianity, Islam, Hinduism and Buddhism. Premised on an understanding of a common historical patriarchal culture, and by drawing parallels across these major religious traditions, I will continue with an examination of what women hope to achieve through having an education in their religion. One of the questions I intend to address here is whether education in religion assists women in their realization of an autonomous identity, or whether it impedes them in enacting their full humanity. Lastly, by taking into account that the three major religious traditions are bound by a common pursuit of justice, and by arguing as Nussbaum (Cultivating humanity: a classical case of reform in liberal education. Harvard University Press, Cambridge, 1997) does, that one of the capacities of cultivating humanity is critically thinking about one’s own culture and traditions, I will explore whether having education in religion, ultimately leads to an enhanced enactment of social justice. Greene, M. (2009). The aesthetic and the artistic in aesthetic education. www.maxinegreene.org/.../articles/downloads.php?...aesthetic...artistic. Accessed 27 Sept 2012. Parekh, B. (1997). When religion meets politics. www.demos.co.uk. Accessed 27 Sept 2012. Polisi, C. E. (2003). Universal rights and cultural relativism: Hinduism and Islam deconstructed. BC Journal of International Affairs, John Hopkins University. www.jhubc.it/bcjournal/articles/polisi.cfm. Accessed 28 Sept 2012. Schreiner, P. (2005). Religious education in Europe. Münster: Comenius-Institut. www.resources.eun.org/etwinning/europa2.pdf. Accessed 26 Sept 2012. Scovill, N. (1994). The liberation of women in religious sources. www.religiousconsultation.org/liberation.htm. Accessed 24 Sept 2012.